If you teach younger students (beginner through fourth year), finding a single method book is tough. 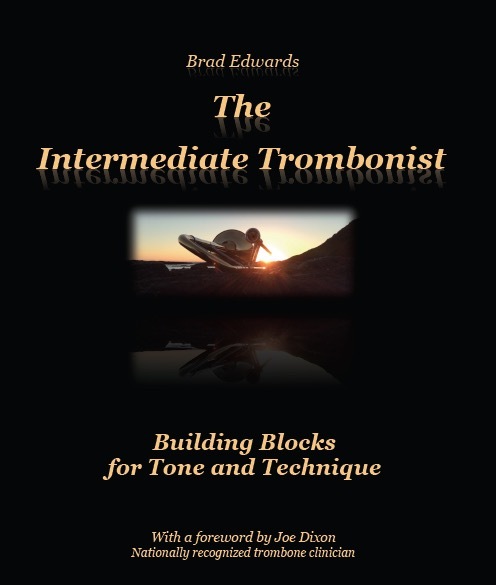 In lieu of cobbling together parts from other books in conjunction with whatever beginner band book the school music teacher has selected, Brad Edwards has created a comprehensive method that spans the gap between beginner and his more advanced books. Typical of Edwards’ other work, this spiral-bound book lays flat and is very easy to read. It is divided into six sections:  lip slurs, pattern building, lyrical legato, varied articulation, and simple tunes in multiple keys. Each section naturally progresses in difficulty, contains superb pedagogy (i.e. the lyrical legato portion thoroughly explains ‘T’ and ‘D’ tonguing, and simple tunes also have chord symbols), and flows directly into the next books he has written. You may purchase these in bundle for a discount. A “Plan of Study” in grid form provides an elegant course for observable improvement. Included is the development of music theory skills with pattern recognition and time and key signature comprehension. Sprinkled throughout are words of wisdom and encouragement at appropriate times. There are over 150 musical examples using Edwards' fantastic composition style – original works that address foundational trombone issues in a musical and thoughtful manner. For an additional cost, 100 duets are available for the last three sections. This compendium is reviewed separately. Blank staff pages are given for personal additions. Seven helpful appendices address comprehensive trombone issues such as overtone series, high range, F-attachment, etc. Appendix 6, “22 Tips to Get Better,” states, “Here’s the part of the book you probably won’t read. (But someday you’ll wish you had! )” These tips should be at the beginning of the book! This method should become a standard, much as the Lip Slurs have become. It is my hope that local and state music boards will adopt this for honor band auditions.